Just ask the San Francisco Giants. A great example of how teamwork and culture can impact results in a significant way is the San Francisco Giants from a few years ago. I’ve been honored to speak several times to their front-office staff, as well as to some of their players and coaches during spring training in recent years. I first partnered with the Giants in the spring of 2010. They had a young team that year, and some talented prospects in their minor league system, so the future looked bright. It seemed like they were a year or two away from being really good, and also like they were starting to develop some real chemistry as a team and as an organization. They ended up making it into the playoffs on the final day of the 2010 season, but all the experts said they didn’t have enough talent to win the World Series. They got hot that October, played incredibly well in the playoffs, proving the experts wrong, and won the World Series for the first time since the team had moved from New York to San Francisco in the late 1950s. It was a huge deal for the entire Bay Area and for Giants fans everywhere. 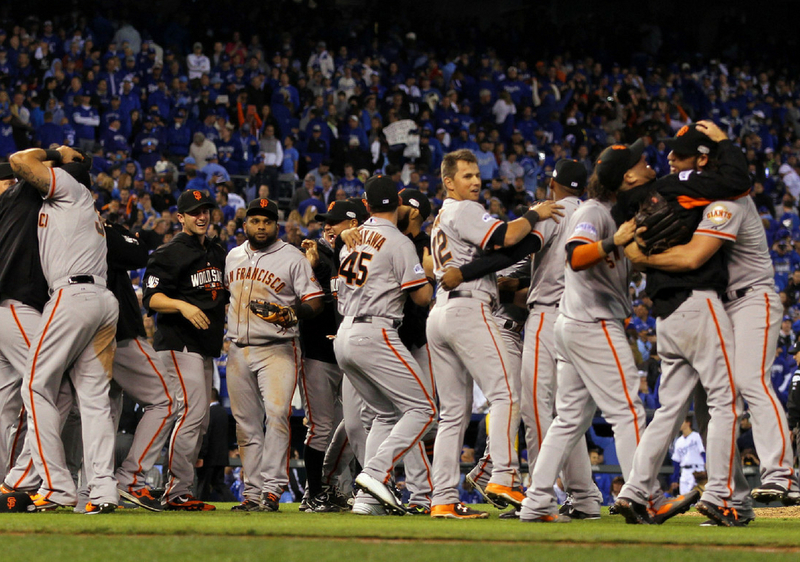 The Giants ended up winning three World Series championships—in 2010, 2012, and 2014—during a five-season stretch. And not only was that incredibly difficult in itself—they did it as underdogs in just about every post-season matchup they were in during those championship runs. They had good talent, but in most cases they didn’t look like the best team on paper. Their ability to play well in big games, fueled by their incredible team culture, is what propelled them to those World Series titles. They seemed to understand and embody all the essential intangible qualities—that non-technical stuff that truly drives success and performance. Two particular examples epitomize to me both the success of the Giants during this championship run, and what it means to care about each other and know that they’re all in it together. On the Friday night of the final home series of the season, the Giants give out an internal award called the “Willie Mac Award.” It’s named after Hall of Famer Willie McCovey, who played for the Giants his entire career, from 1959 to 1980. It’s voted on by the team and coaching staff, and is given to the most inspirational player each year. In 2013 the award went to Giants right fielder Hunter Pence. Hunter was an All-Star player who the Giants picked up at the trade deadline the season before. He became the team’s inspirational leader in the playoffs in 2012, and his energy and enthusiasm in the clubhouse and dugout, as well as his play on the field, helped lead them to their second championship in three years that previous season. He played really well in 2013, but the team was, unfortunately, not going to the playoffs that year. I was at the ballpark for that last Friday night home game of the 2013 season, and was excited to see the announcement of the Willie Mac Award, which is always a big deal and a fun ceremony. I was fired up when they announced that it was Hunter Pence, who seemed quite deserving of the award, and I also looked forward to hearing him speak, since he’s such a passionate guy. I was deeply moved by Hunter’s courageous and vulnerable expression of love for his teammates. Telling them he loved them in front of 42,000 fans (let alone the multitudes watching it on TV), and the fact that he underscored it by saying that love is the strongest thing they had together, made my heart sing on so many different levels. Fast forward to the next season (2014): The Giants are back in the World Series, it’s game seven, and they’re on the road against the Kansas City Royals. With two outs in the bottom of the ninth inning, they’re up by one run, but the Royals have the tying run on third base. Giants pitcher Madison Bumgarner gets Royals catcher Salvador Pérez to hit a pop-up into foul ground. Giants third baseman Pablo Sandoval catches it for the third and final out of the game, and they win their third World Series title in five years. As Buster Posey, the Giants’ All-Star catcher, comes out to the mound to give Bumgarner a celebratory hug, these two big, strong, tough men from the South— Georgia and North Carolina respectively—embrace each other. And right before the rest of the team comes piling out of the dugout to jump on top of them, you can see Bumgarner lean over and say into Posey’s ear, “I love you!” It was one of the most heartwarming things I’ve ever seen on a baseball field. It moved me to tears and epitomized what a championship team is all about—caring about each other, knowing that they’re all in it together, and, ultimately, loving one another. Creating a championship team takes commitment, courage, and faith. We have to be willing to put our egos, agendas, and personal ambitions aside, at least to some degree, so that we can focus on the bigger goal and vision. A great team epitomizes what we mean by the whole being greater than the sum of its parts. With our work teams, this is about being all in, having each other’s backs, and being willing to work through issues, challenges, and conflicts together. It’s also about making a commitment to care about each other as human beings. This isn’t always easy to do, but it’s necessary if we’re going to create the kind of success and fulfillment we want. And when we do this, we become part of something bigger than ourselves, and we give meaning and purpose to the work that we do and to our lives—which is what bringing our whole selves to work is truly all about. What are you doing to create a championship team around you at work? What else is needed to ensure the success of your team? Post your reply in the comments, or directly on this blog post on my website. This is a excerpt from Bring Your Whole Self to Work, by Mike Robbins, with permission. Published by Hay House (May 2018) and available online or in bookstores. Mike Robbins is an expert in teamwork, leadership, and emotional intelligence. He's a thought leader and sought-after speaker who delivers keynotes and seminars that empower people, leaders, teams, and organizations to work together effectively and be more successful. Mike is the author of four books: Focus on the Good Stuff, Be Yourself Everyone Else is Already Taken, Nothing Changes Until You Do, and his latest, Bring Your Whole Self to Work. His books have been translated into 14 different languages. Mike has worked with some of the top organizations and institutions in the world such as Google, Wells Fargo, Microsoft, Gap, the U.S. Department of Labor, eBay, Harvard University, IMF, Genentech, Adobe, Schwab, Airbnb, and many others. Mike has been featured on ABC News, the Oprah radio network, in Forbes, the Washington Post, and many others. He was a regular contributor to Oprah.com and the Huffington Post, and currently contributes to Medium, Thrive Global, and Others. He's also the creator and host of the Bring Your Whole Self to Work podcast. My Son's Graduating High School, and Everything I Taught Him, I Taught Him Through Baseball.